Pat Brown pauses to consider a question about how he has changed across thirty-nine years at UVM. Outside the windows of his Davis Center office, the sidewalks begin to fill with students at class change. “My hair is shorter; I still haven’t shaved,” he concludes. Indeed, the thousands of students/now alumni Brown influenced across his decades leading UVM Student Life (four years as assistant director, thirty-five as director) would still recognize him by his scruffy beard, now more white than red. If not that, then his John Lennon wire-rims and the Hawaiian shirt of a Fort Lauderdale born-and-raised surfer whose heart never left the beach. Brown retired in June and is likely harvesting a sizable garlic crop in his Williston garden right about now. 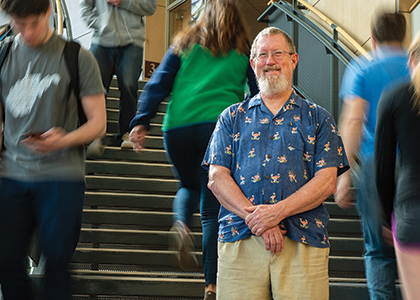 Throughout his career at Student Life, Brown fostered and led a track of learning complementary to the undergrad academic experience. What is Student Life? Outing Club, WRUV, The Vermont Cynic, Greek Life, Program Board, Alternative Spring Break, and the Student Government Association, to name just a few. These are places where students find fun and friendship, yes, but many also discover a career path or a broadening of perspective that shapes the rest of their lives.